Who's ready for a new challenge? 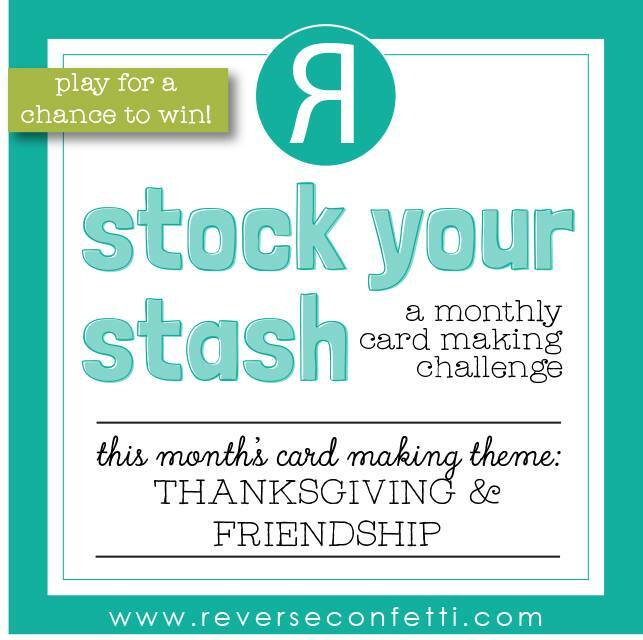 Reverse Confetti has a new theme for your : Thanksgiving & Friendship. Go over at their blog for more details and play along ! For today's card, I used the Fall Foliage stamps and the Fall Foliage Confetti Cuts as the focal point. 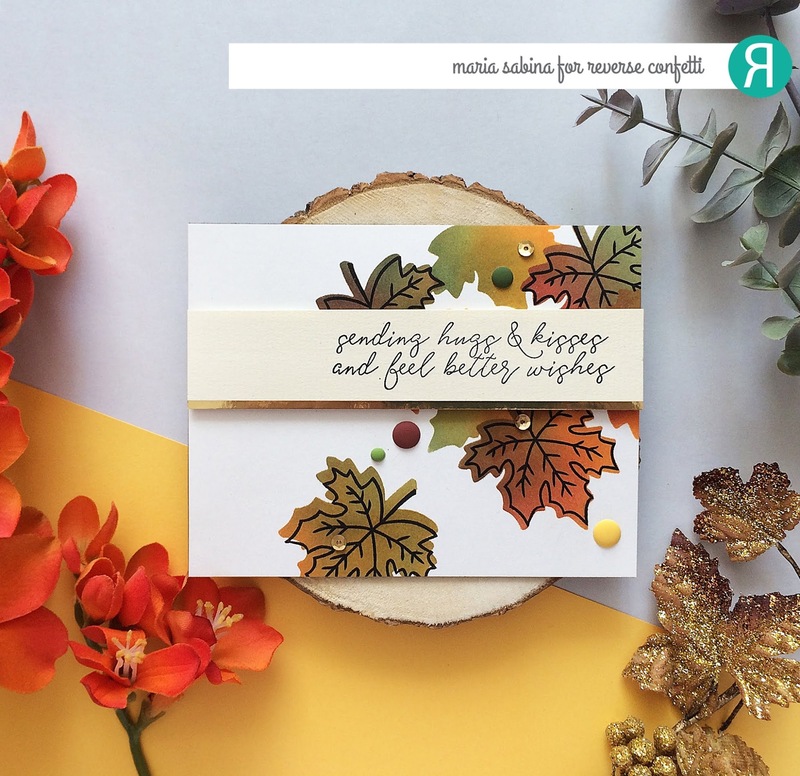 I wanted to create the look of autumn leaves and for that I used the leaf die to do some masking and ink blending. I love the natural look of these leaves. You can use markers or watercolors if you don't want to do the ink blending.Feel free to play with your supplies and see what you like. I'm happy with the final result. It would make a great card for any friend. To finish off the card, I stamped this beautiful sentiment from Cotton & Thistles. As always,there's more to see over at Reverse Confetti. Feel free to share your thoughts or your questions in the comments below. I don't really ever make wedding cards as we don't really give cards on weddings. But I couldn't resist when I got the beautiful chipboards from Scrapiniec. 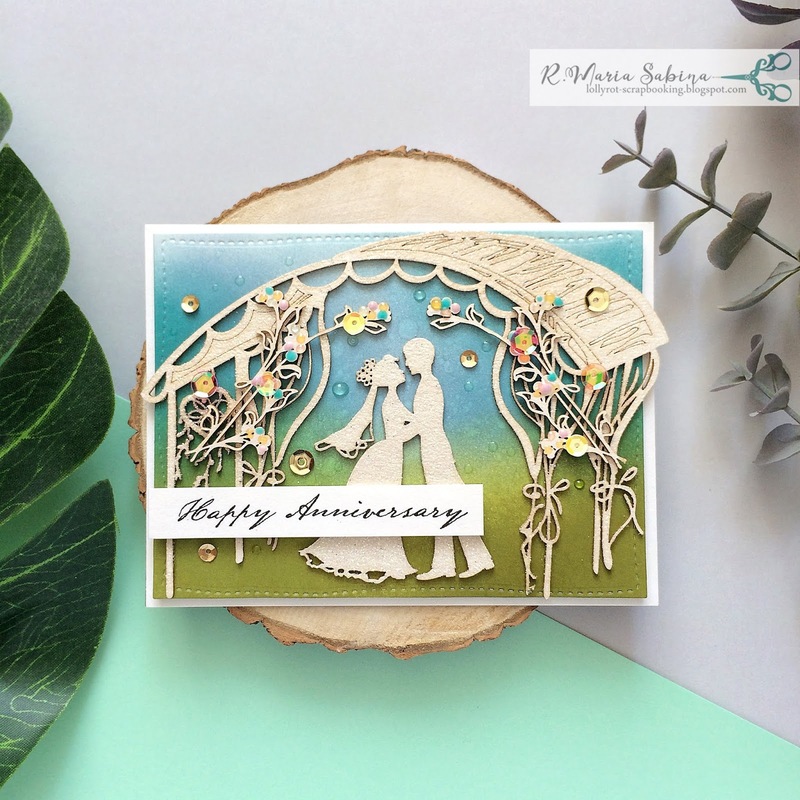 They are so beautiful and great for an anniversary or wedding cards. I had to make one! 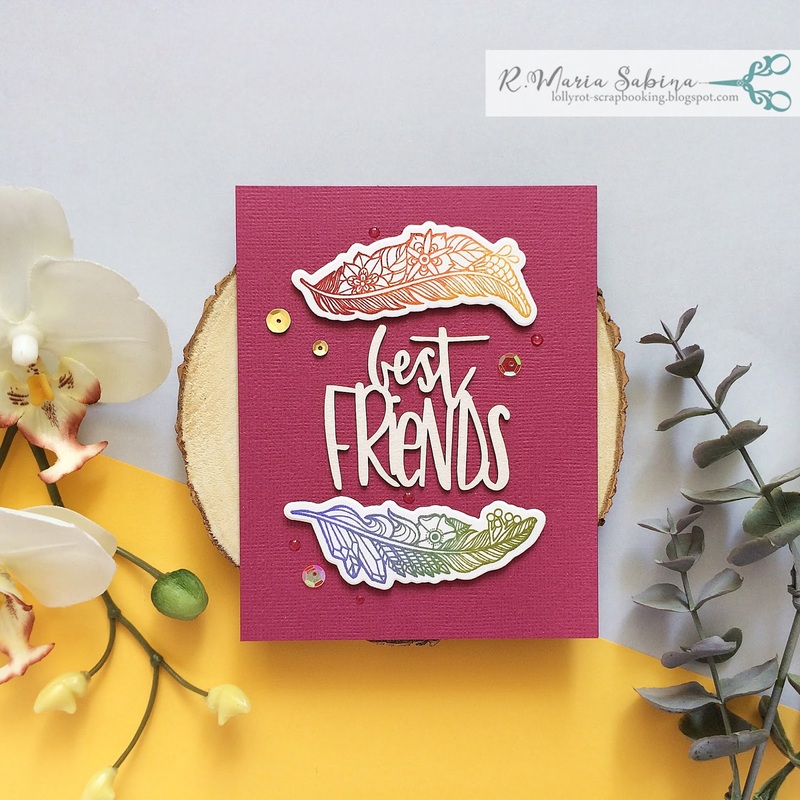 I kept the design pretty simple and just added some clear glitter embossing powder to add some texture and sparkle to my chipboards. I love the result and I think I will wait for the right moment to give this card away. 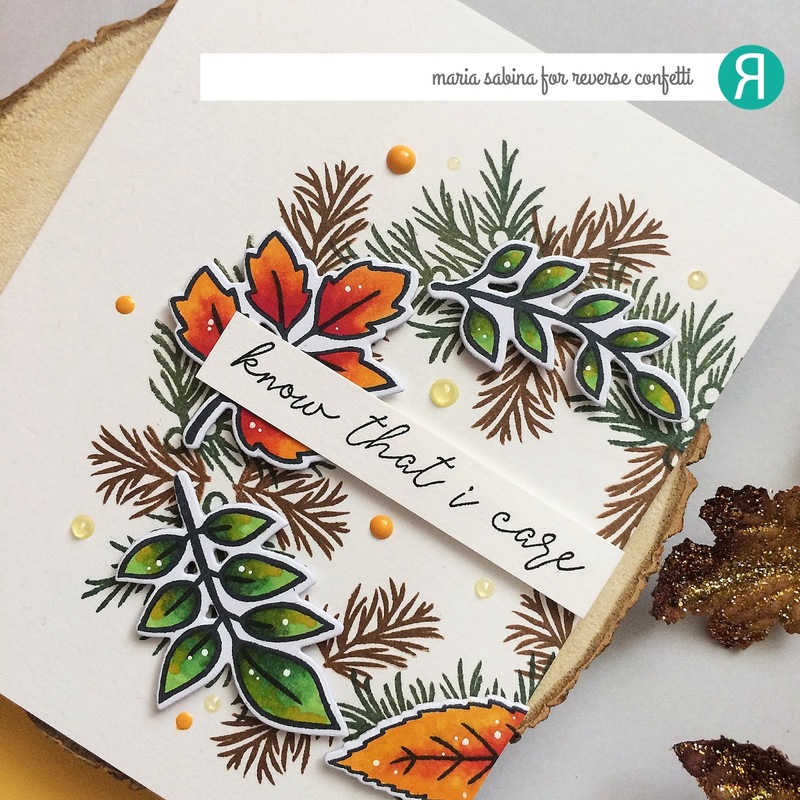 Over at Scrapiniec you can find so many wonderful chipboards for different themes or seasons. Go and have a look! Hope you like today's card. If you do,feel free to share this post with your friends and maybe create a wedding card. Thanks for stopping by! Have a great day! We can never have enough flower stamps in our stash,right? So many different designs and perfect for so many ocassions. 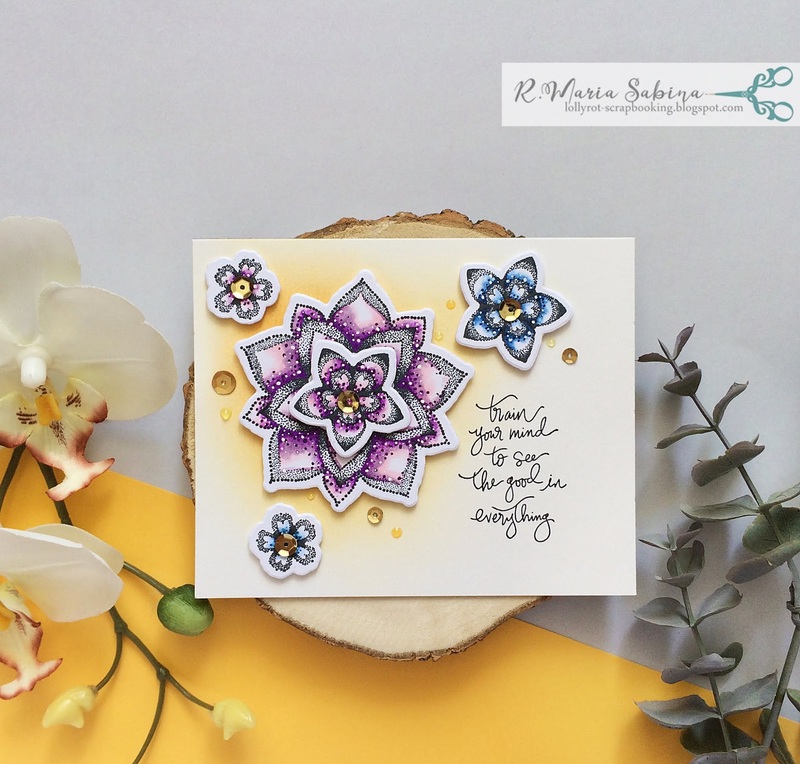 I had some fun playing with the Dot Mandala Cool Vibes by Stephanie Low Stamp and Die Set from Spellbinders. A nice and simple design that works for masculine and feminine cards. I wanted my card to look more feminine and I used some markers to add a touch of color. This set has a nice sentiment that can be a great one for a sympathy card. I like that touch of yellow ink blending behind the flowers. If you like today's card, please feel free to check the previous posts and come again for more. I love sharing my creations with you all. You can also find me on Instagram for more updates. Are you in the mood for another Halloween card? 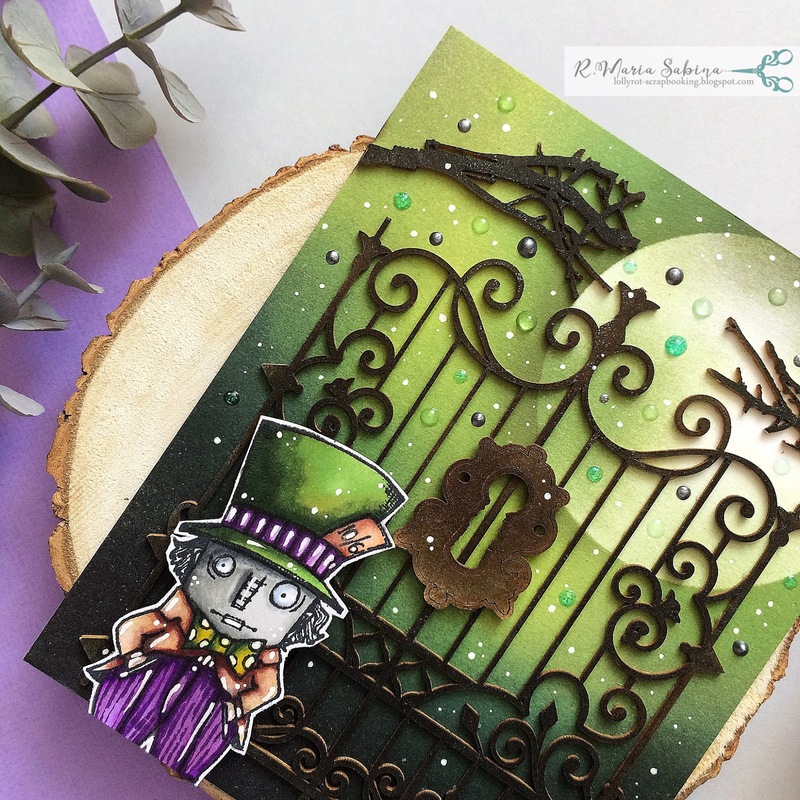 I also have a video on my Youtube channel on how I made the background for this card,if you would like to check that out. 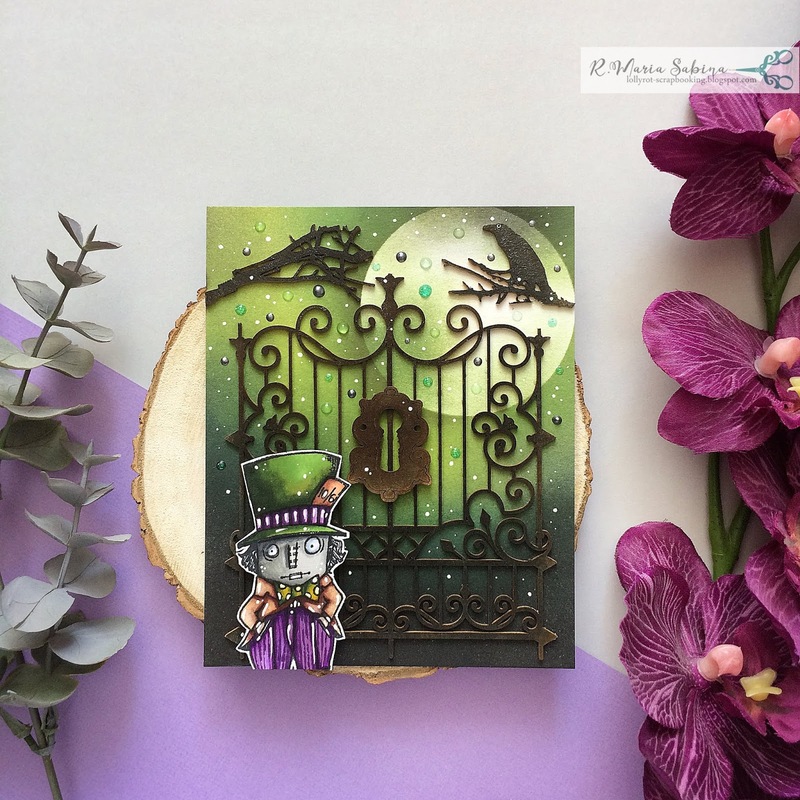 I used some beautiful Halloween themed chipboards from Scrapiniec to decorate the front of my card,along with Mad Hatter stamp from Stampotique. You can also check out Scrapiniec for other beautiful chipboards.They have really nice designs, perfect for any project! 3568 - Secret Garden - Sign eng.- Szyld ang. I think this is probably my last Halloween card for this year. I really enjoyed creating them,but we don't really celebrate this holiday. I think someone will be happy to get some happy mail from me. I really like this background and the NUVO drops look very nice. Maybe a bit too much,but sometimes we can go extra with the NUVO drops. As always, thanks for stopping by. If you have questions, please let me know in the comments below. Have a great day! 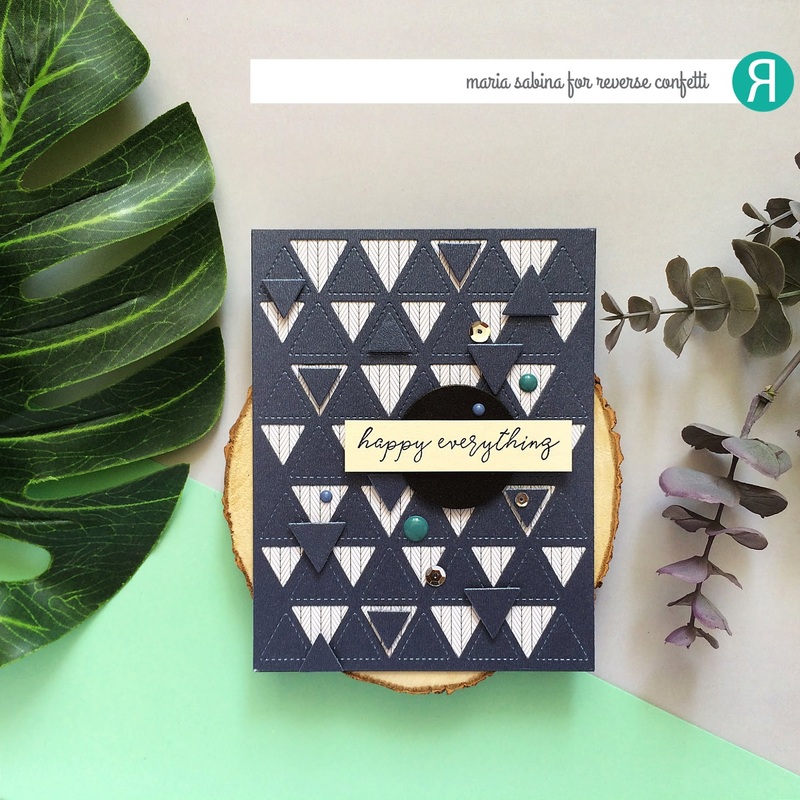 It's time for a blog hop with Reverse Confetti and some wonderful bloggers. 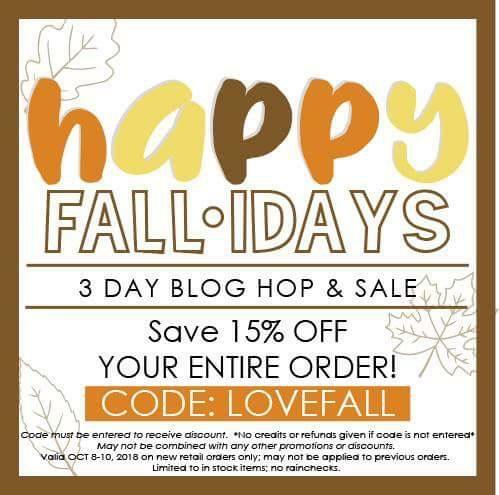 If you had something on your wishlist from Reverse Confetti,then take this chance and use the code: LOVEFALL for 15% off. For today I made a card following the theme :Halloween/Fall. I used the stamps from Christmas Candles and Fall Foliage to create a fall wreath. 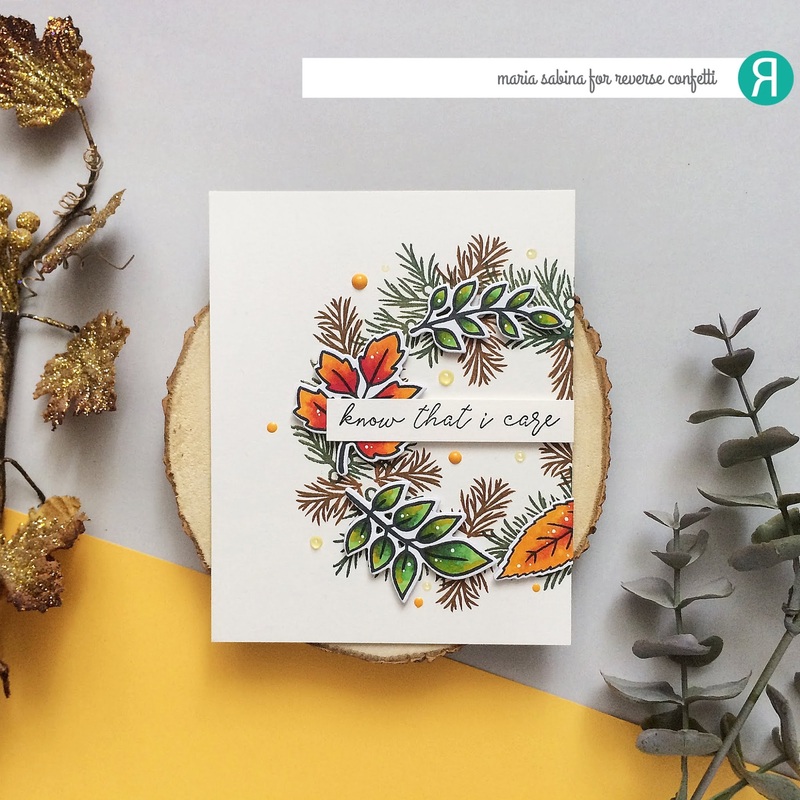 I need more sympathy cards in my stash and the sentiment from Cotton & Thistles goes so well with the rest of my card. I think it would also make a great Thanksgiving card. If you are new to blog hops, then all you have to do is to check out the list below and leave some love to the bloggers taking part of this hop. You get to see some great inspiration on how we use the Reverse Confetti and other great things. Maria Sabina - YOU ARE HERE!!! Hope you enjoy this card. Thank you for stopping by! Have a great day! I hope you are doing well. 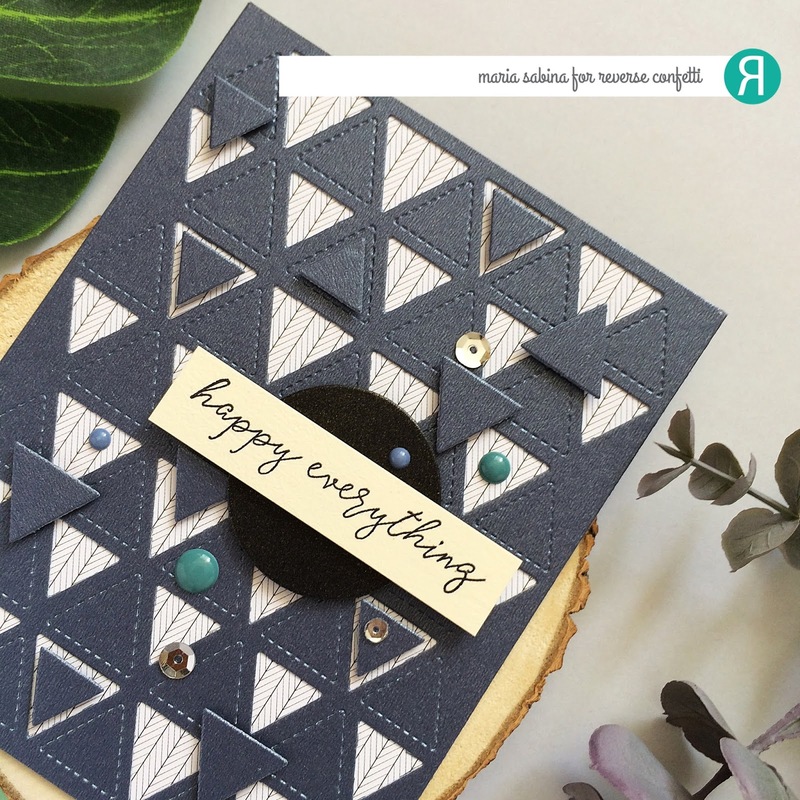 When I first got started into cardmaking, I had no idea about dies, stamps and all the other crafty supplies. Slowly I got to learn about dies and the Spellbinders ones were my first dies.Really nice quality and 8 years later I still use them. I got some goodies from Spellbinders and I'm happy to share the first card I made,using the Feathers Cool Vibes by Stephanie Low Stamp and Die Set. I really like this set.You get matching dies, if you want to do some die cutting. The set doesn't have a sentiment,but I wanted to add a fun one and I found this chipboard from Scrapiniec in my stash. I like how clean and colorful this card is. 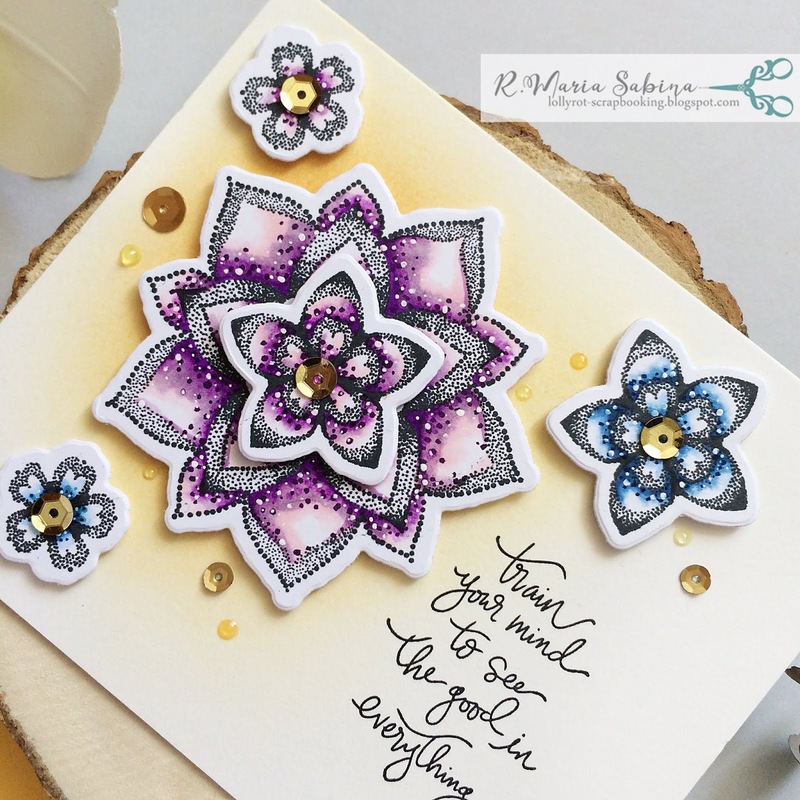 If you want to see what other stamps & die sets Spellbinders has then visit their website. 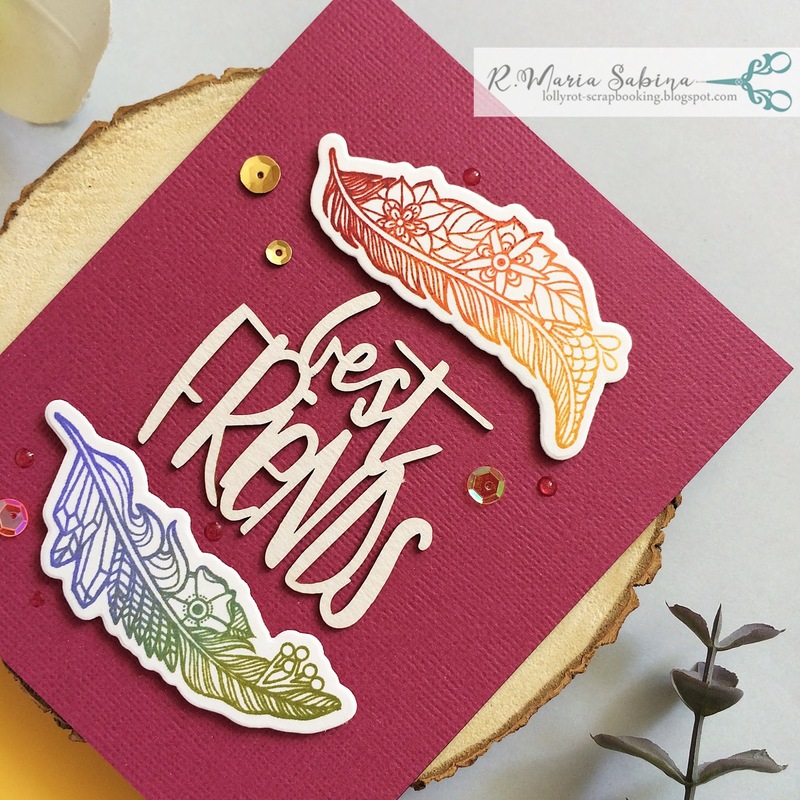 Feathers Cool Vibes by Stephanie Low Stamp and Die Set. Hope you are having a great day so far. I always like to give a new look to the stamps I have in my stash. A great way to get that new look is to use masking. It takes some extra work,but you can get some new beautiful designs. This cute bear from Create A Smile on the original design,has two baskets on his bike full of letters. I wanted mine to have an autumnal look. 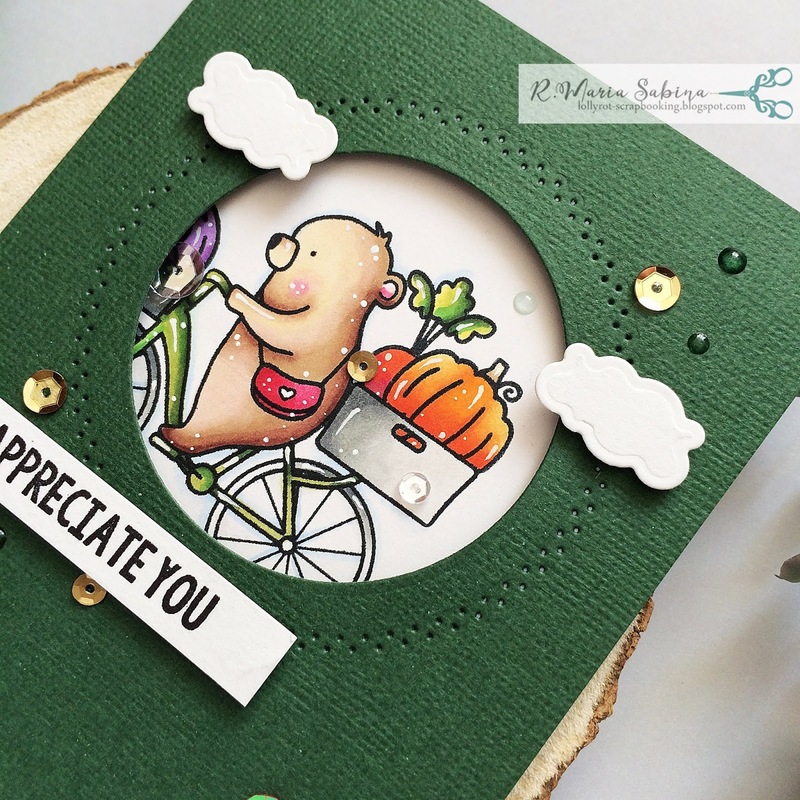 So I used some vegetable stamps from Clearly Besotted. I used NUVO markers from Tonic Studios for coloring. Super simple and quick coloring.I think it would look very nice in no line coloring. Remember to send cards to the loved ones as a reminder that you appreciate them. I hope you enjoy today's card and you are going to use the stamps you have more often with a bit of masking for a different look.